Comments: Worthwhile for new fans, but old fans might not get into it. Most Japanese singers tend to release fewer albums than their American counterparts. However, this is counterbalanced by the fact Japanese pop singers release many singles and their full albums tend to be, generally, made up largely of those singles. 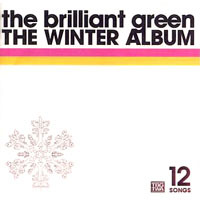 J-Rockers The Brilliant Green are no exception, The Winter Album (released December 4th, 2002) is the follow up to the 2001 (January 1st, no less) Los Angels . However, the band has been busy during the last year. Lead singer Tomoko released her own pet album, Tommy February 6 and the entire band has a couple of singles. Sony's website describes the disc as with this memorable line: In the silence of the night, snow and stars are crystallizing into 12 brilliant songs. In reality, the CD stacks up reasonably well against The Brilliant Green's previous work, but may alienate some long-time fans. The CD begins with a short Yule-time introduction featuring vocals by Tomoko. It is with this intro that the CD lacks the edge the band's previous work, which was heavily influenced by Western 60s/70s rock The Winter Album does carry a theme, unlike the grungier material that is the rest of the band's canon. As in the tendency for The Brilliant Green, Okuda Shunsaku and Matsui Ryo (bassist and guitarist, respectively) provide excellent instrumentals for the band, that neither overpower nor are overwhelmed by Tomoko's rich vocals. Holidays! is a catchy tune, which highlights the album's theme; The Winter Album seems an homage to 60s pop rock (the band has previously treaded through 60s style folk and rock before), especially the Beatles. In the steady bass and the catchy chorus, one can catch shades of The Fab Four on this track and throughout the album. This makes sense, as Okuda Shunsaku (Jun-chan) lists the Beatles' Rubber Soul as a major musical influence. With guitars and violins, this too seems to channel many of the world's most influential rockers. As mentioned before, this is style is different from the band's previous works. That's not to say Flowers is bad. It delightfully textured and borrows ideas from the Beatles and other rockers without stealing wholesale. I'm So Sorry, Baby! was originally released previously as a single and features much stronger guitar than the previous tracks, especially throughout the guitar solo, though it would still be considered fairly light overall when compared to the band's other works. Track five was also previously released as a single earlier this year. Slower than the previous track, Forever to Me is catchy, but isn't as infectiously so as the previous track. The Boy Waits for Me is extremely upbeat; it resembles the CD's ninth track, Rainy Days Never Stay in its energy and singability; it's probably the catchiest tune on the album behind Rainy Days. The guitar on this song is great. The track also features a few little vocal/audio tricks The Brilliant Green hasn't used before. Track seven is a slow down from six, featuring Tomoko's vocals, as well as acoustic guitars and violins. Like Flowers, The Night Has Pleasant Time is a textured song, with bolder violins later in the song, but is simpler than the earlier track. Day After Day starts with a steady snare drum. It's one of the most pop rock songs on the album. Some of the guitar, especially in the beginning, feels like it could have come from a commercial. The track is definitely a feel good track. Some of the instrumentals contribute to this; the song features a hint of piano. Rainy Days Never Stay is probably my favorite song on the album (except perhaps The Boy Waits for Me). One of the latest singles from the band, the song features some inspired guitar and is one of the few English (more or less) songs on the album. The entire song is extremely catchy. The entire thing feels impressive and grand, yet personal at the same time, due in part to the careful use of synth. Also in English, I'm Jus' Lovin You was also released previously as a single. Guitar based, the song feels more like the band's earlier, lighter music. The Brilliant Green's music was a mix of harder rock and this style; on previous albums this would be one of the lightest things on the CD. Here it is one of the harder guitar based songs. It's a good song, but not as catchy as tracks nine or six. Track 11 starts out with a heavy bass. It starts extremely different, much more abstract than the rest of the album. The chorus is more traditionally The Brilliant Green guitar based rock (much closer to the style of earlier work), but it is only an interlude from the abstract bass sequences. It resembles some of American pop singer Matthew Sweet's work. The song works extremely well and is probably the most different (and yet, compared to the band's earlier work, most traditional, in the chorus) track on the album. Escape features some differing sounds effects/synth as it starts and which recur during the chorus. It's a good track to listen to; not exactly fun, it seems to have a tinge of sorrow, but not bittersweet either. It's guitar based and ends the album well. Overall The Winter Album will most likely please newcomers and old fans (though the latter might have to listen to it a few times to be won over). There are some complaints I have with the album; it would have been great to have the song I'm a Player in T.V. Games (released on the Forever to Me single). The Album Versions of previously released songs don't differ very much from their singles counterparts. However, for the BuriGuri fan, The Winter Album is special Christmas treat.